Home » Events » Save the Date! Open House with David Collins on Thursday, September 13th at 5:30 p.m.
Save the Date! 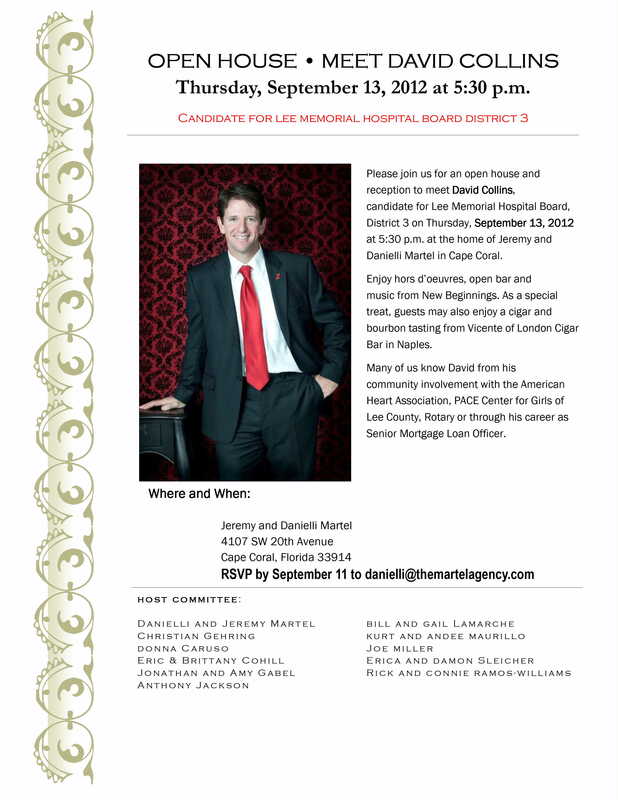 Open House with David Collins on Thursday, September 13th at 5:30 p.m.
Come out at meet David Collins, candidate for Lee Memorial Hospital Board District 3, on Thursday, September 13 at 5:30 p.m. at the home of Jeremy and Danielli Martel in Cape Coral. Enjoy hors d’oeuvres, open bar, and music from New Beginnings. As a special treat, guests may also enjoy a cigar and bourbon tasting from Vincente of London Cigar Bar in Naples. Many of us know David from his community involvement with American Heart Association, PACE Center for Girls of Lee County, Rotary or through his career as Senior Mortgage Loan Officer.